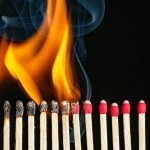 The latest credit data paints a gloomy picture for the housing market. 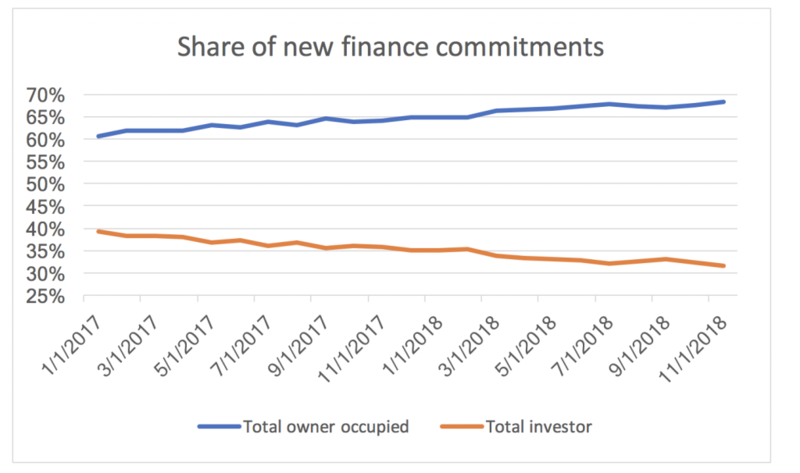 Over the past year or so, we’ve seen new finance commitments trend down for owner occupiers and investors, and a very significant increase in loan rejections. Credit could get even tighter once the Royal Commission into financial services hands down its recommendations. For a long time, this blog has argued that Australia has been in a big property price bubble. During the last year, we have started to see this reverse due to a number of reasons including the APRA speed limits but probably the most obvious catalyst has been the Royal Commission into financial services and the emphasis that Commissioner Hayes put on prudent lending standards. For anyone who is not familiar with what the Commissioner took exception to, the banks have historically been relying heavily on an expenditure benchmark called the Household Expenditure Measure or HEM for short. The HEM was never designed to be used in this way by the academics that designed it, but the banks have been using it for more than 70 per cent of loan applications in recent years. As I have written in the past, the HEM severely underestimates a family’s expenses and, hence, borrowers have been able to borrow much more money than they would have been able to had the banks done a proper investigation of actual expense levels. Even though the Royal Commission has not yet delivered its final report (it is due to be handed to the government on 1 February 2019 and released to the public on 4 February 2019), it strongly criticized the banks’ use of the HEM which resulted in stricter lending criteria including asking for verification of actual expense levels. With tougher criteria in place for the last six months, I thought it would be interesting to see the effect. As mentioned previously, I am a fan of Martin North and his blog Digital Finance Analytics, surveying over 50,000 households. 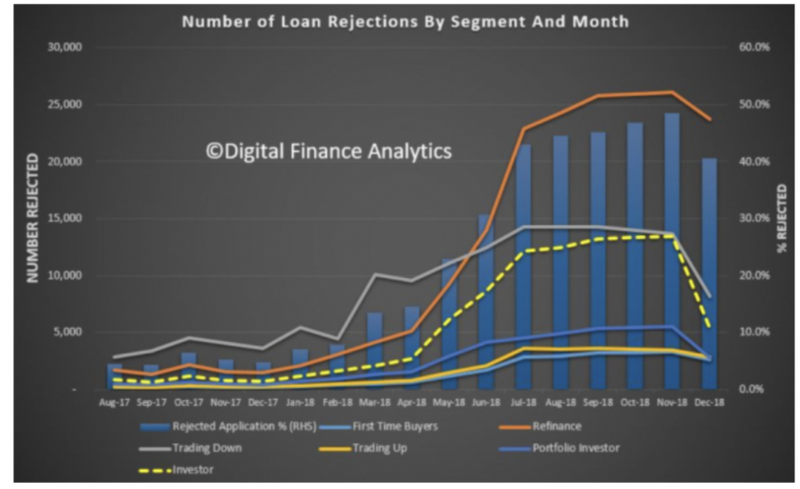 The first chart here shows the total number of loan rejections over time. We should focus on the blue columns, which show a very significant increase in loan rejections since April last year which was the time that the Royal Commission put the spotlight on lending standards. The portion of rejections per month is up by about 3.7 times from about 13 per cent per month in April 2018 to approximately 48 per cent in November. It is an even bigger increase if we compare this back to November/December 2017 when only about 5 per cent of loan applications were rejected. We can also see that the biggest increase in rejections is for investors (the yellow dotted line) and for refinancers (the orange line). What we are seeing here is clearly the impact of banks taking a good look at the total expenditure levels and indebtedness of borrowers and also APRA’s cap on interest only lending. 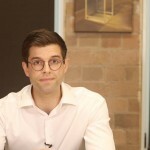 The large increase in refinance rejection is particularly worrying as it means that a lot of people are going to be “locked” into their existing mortgage without a possibility to hunt for a better deal and lower their monthly outgoings. It is also interesting to look at the chart below, which shows that it is indeed the major banks that have tightened their lending criteria whereas non-bank lenders have not been as aggressive in tightening their standards. Next, let’s turn to the Australian Bureau of Statistics, which on 21 January released its lending statistics covering new finance commitments. 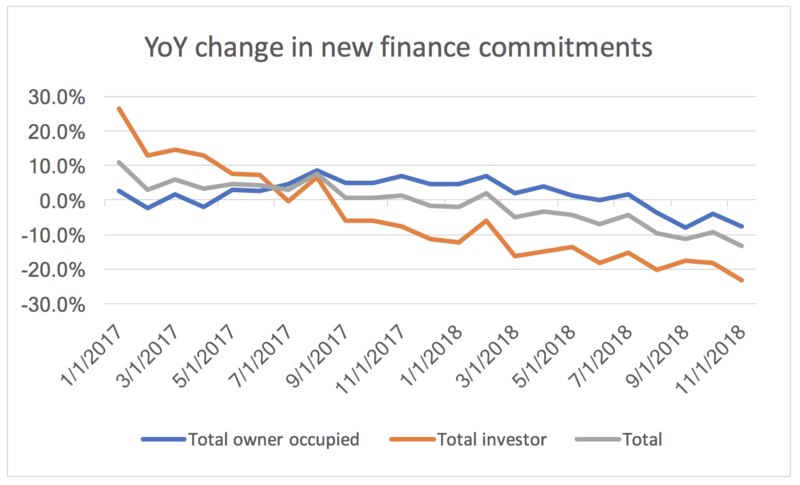 We can see a very clear down trend in new finance commitments for owner occupiers and, even more so, for investors, which is declining by about 20 per cent year over year (YoY) currently. We can also see that investors’ share of new finance commitments has fallen from around 40 per cent at the beginning of FY2017 to just above 30 per cent currently. It will certainly be very interesting to see what happens once the Royal Commission releases its final report. It seems to be that in the current political climate, it will be very hard for politicians to disregard any recommendations from this report and there is hence potential for even further tightening of credit, especially to investors. This does not bode well for the Australian housing market and, by extension, the Australian economy. As I have written before, I very much struggle to see that the RBA will increase interest rates in the foreseeable future but instead expect the next movement to be a cut which should be very negative for the Australian dollar. Its all about what we eschew in this case Brock. I don’t know how the banks have not announced large profit downgrades given not only the material slowdown in loan issuance but also the 10% (and falling) or so decrease in the assets backing the careless loans already on the books. Much to my dismay I have even seen Roger himself take a positive view on the banks recently. As far as the aud goes I think it is the sacred cow of the financial world. As bad as things look for the future of the Oz economy, the finance ‘experts’ remain very sanguine. 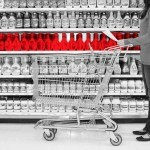 Good analysis such as in this blog post is completely ignored. I would have expected a material sell off in the aud by now but foreign investors seem to love to stuff money into this broken economy even with lower returns than the US. These markets remind me of a quote from Isaac Newton along the lines of “I can predict the movements of the stars and planets in the universe, but I cannot predict the madness of man”.